2019 Session – contact your legislators! *Support a public vote for a PFD Constitutional amendment guarantee or your PFD shareholder rights will be lost. 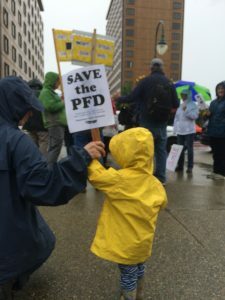 *Call on lawmakers to restore the PFDs cut in 2016 – 2018. CHECK HERE FOR ACTION ALERTS AND INFORMATION DURING THE SESSION. Also at www.facebook.com/PFDAK for Permanent Fund Defenders on Facebook. Q. What’s the best weapon to defend the Fund and PFD from this raid? A. 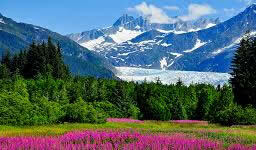 YOU standing together with Alaskan voters to make your voice heard to protect the Fund and PFD. Demand a public vote on using PFD money and for a Constitutional amendment to guarantee the PFD. That’s the plain truth. Every single Alaskan who receives a PFD that is angry about this raid has a right and duty to stop it. How? 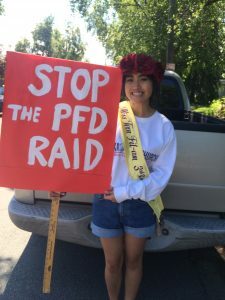 Get informed, join and support groups fighting the raid, get neighbors and family involved, contact your representatives, stand together as voters demanding our representatives find the best options to meet our economic challenges while preserving our Fund and PFD. Vote them out of office in the next election if they ignore Alaskans’ rights. Simply put, if you don’t use your right to protect the PFD, you lose it. Don’t expect someone else to do this, it takes a majority of Alaskans to win this huge battle for the Fund. Hold our elected officials accountable. Speaking out to the legislators and joining this fight can save our PFD for now and future generations. Go to www.akleg.gov or call the LIO (Anch) at 269-0111 to find out who your Legislators are. PUBLIC HEARINGS! Call: 844-586-9085. Visit the LIOs. Email them for the record. (list on the RESOURCES page) Go to Permanent Fund Defenders on Facebook for current bill info. Whatever the solutions are we must take the PFD and using earnings without consent OFF THE TABLE. LIKE AND SHARE on Facebook. Get your neighbors and families involved!! 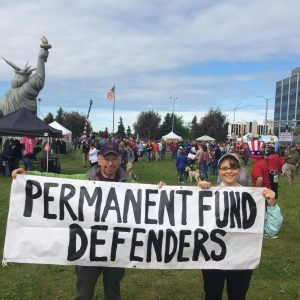 JULY 4, 2017, ANCHORAGE – Permanent Fund Defenders at the reading of the Declaration of Independence. We agree with the U.S. founders, NO PFD TAX WITHOUT CONSENT. See this column by Dr. Jack Hickel to strengthen your understanding on defending our Fund and PFD. Alaskans own the Permanent Fund. Pass a constitutional PFD amendment for a public vote. Restructuring the PFD and Fund can endanger this system. Stop stealing and changing the PFD and Fund for government spending without public approval. These are the voters’ decisions. Discuss other revenue solutions and government cuts. The PFD cut is an unfair, regressive tax on low income people and severely hurts the economy. We will remember elected officials who steal the Peoples’ money and vote them out. Helpful TIP: Keep this message to defend the Permanent Fund and dividend short and respectful or they may not read it! If you want to send a long, detailed message please send it separately from a short statement on your support for these main points. Learn about the Permanent Fund and PFD – You own the Fund as an Alaska resident. Help others learn this and ask them to speak out! Pay attention during the 2018 session and find out what action to take. Your voice and vote matter. Ask your family and neighbors if they know what’s happening and help them start contacting legislators, too. Know your legislators and contact them with email, letters, calls, testimony and demand a public vote on the PFD, and VOTE. 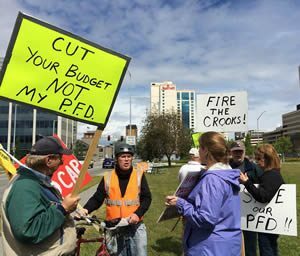 Donate to PFD groups who are producing ads and events to defend Alaskans’ public interest. Volunteer with groups on Facebook (www.facebook.com/PFDAK) and in the community to gain support. Sign petitions to send public opinion to Juneau. Demand more public communication from legislators and media to inform the public and discuss all budget solutions. VOTE for pro-PFD candidates in Nov. 2018!